Supplied as 20 Garden Ready Plug Plants, all ready for you to plant straight out! The Busy Lizzie is back! 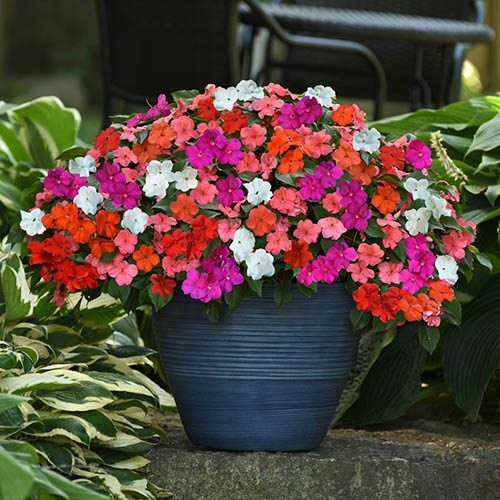 The number-one bedding plant grown in the UK for years is making a return with a breeding breakthrough of mildew resistnce to bring a riot of summer-long colour to your garden. Supplied as 20 Garden Ready Plug Plants - we've done all the initial work for you, so you can plant them straight out. when risk of frost has passed. Supplied as 20 Garden Ready Plug Plants, big enough to plant straight out once frost risk has passed. Allow plants to harden off for a week or so before planting out, and only do so when all risk of frost has passed. Plant in containers with a good, multipurpose compost or in the flower border in fertile soil - it helps to dig in plenty of well-rotted organic matter. Water regularly, preferably from under the plant, and remember that containers will require more regular watering. Feed with a general-purpose feed once a week when in bloom.